Geoffrey Chaucer (c. 1343 – October 25, 1400) was an English author, poet, philosopher, bureaucrat (courtier), and diplomat. Chaucer is best known as the author of The Canterbury Tales. He is sometimes credited with being the first author to demonstrate the artistic legitimacy of the vernacular English language, rather than French or Latin. 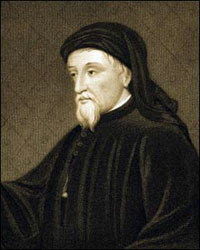 Chaucer was born around 1343 in London. His father and grandfather were both London wine merchants (vintners); historical evidence indicates that Chaucer’s family was well-to do – upper middle-class if not in the elite. Chaucer’s father had connections which enabled his son to become a page to Elizabeth de Burgh, the Countess of Ulster from 1357 onward; later Geoffrey served in the royal court of Edward III as a valet to Lionel of Antwerp. In 1359 Chaucer travelled with the English army under Edward III to France during the Hundred Years’ War. In 1360, he was captured during the siege of Reims, becoming a prisoner of war. Edward paid a ransom of 16 pounds, and Chaucer was released. Chaucer traveled from England to France, Spain, Flanders, and Italy (Genoa and Florence), where he came into contact with medieval continental poetry. Around 1366 Chaucer married Philippa (de) Roet, a lady-in-waiting to Edward III’s queen, Philippa of Hainault, and a sister of Katherine Swynford, who later (ca. 1396) became the third wife of Chaucer’s friend and patron, John of Gaunt. It is uncertain as to how many children Chaucer and Philippa had, but 3 or 4 are the numbers most widely agreed upon. Chaucer wrote poetry as a diversion from his job as Comptroller of the Customs for the port of London, and also translated such important works as The Romance of the Rose by Guillaume de Lorris (extended by Jean de Meun), and Boethius’ Consolation of Philosophy. However, while many scholars maintain that Chaucer did indeed translate part of the text of The Romance of the Rose, others claim that this has been effectively disproved. He also wrote the Parlement of Foules, the House of Fame, and Chanticleer and the Fox, the latter based on a story by Marie de France. However, he is best known as the writer of Troilus and Criseyde and of The Canterbury Tales, a collection of stories (told by fictional pilgrims on the road to the cathedral at Canterbury) that would help to shape English literature. In the history of English literature, he is considered the introducer of continental accentual-syllabic metre as an alternative to the alliterative Anglo-Saxon metre. He also helped to standardise the southern accent (London area) of the Middle English language. Chaucer wrote a Treatise on the Astrolabe, for the son of a friend, that describes the form and use of that instrument in detail. Although much of the text may have come from other sources, the treatise indicates that Chaucer was versed in science in addition to his literary talents. After the overthrow of his patron Richard II, Chaucer vanished from the historical record. He is believed to have died of unknown causes on October 25, 1400, and there is speculation that he was murdered by enemies of Richard II. He is buried at Westminster Abbey in London. In 1556 his remains were transferred to a more ornate tomb, making Chaucer the first writer interred in the area now known as Poets’ Corner.